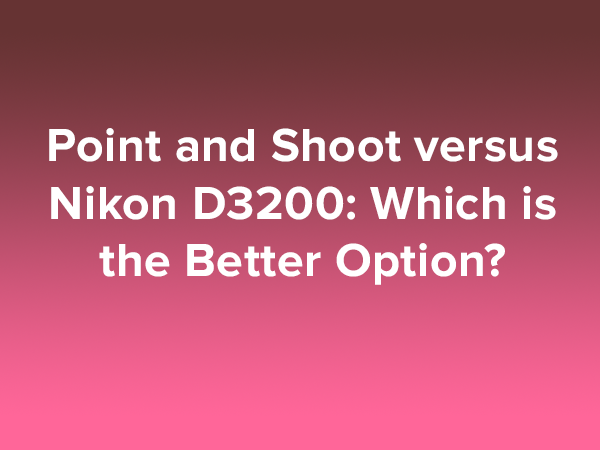 Point and Shoot versus Nikon D3200: Which is the Better Option? Camera & Lenses Point and Shoot versus Nikon D3200: Which is the Better Option? When you think about buying a camera, the most important decision you need to make is whether to buy a simple “point and shoot” camera or whether to go for the real thing—a DSLR. The perception is that the “point and shoot” is inexpensive, as easy to use as your iPhone and about as small while the DSLR with its interchangeable lenses is too expensive, too complicated and too big. While this may have been the case in the past, today there are incredible DSLR’s available for almost the same price as a high end “point and shoot and an entry level DSLR like the Nikon D3200 is just as easy to use as the simplest of “point and shoot.” Today, the decision is exclusively about size and preference. Point and shoot cameras have gained more positive reviews over the years as they have become more advanced and sophisticated. Mature photographers who years ago may have balked at using these cameras are now considering them to be more professional, legitimate and affordable products. However, the clear imaging and proficiency of the Nikon D3200 is without question and some may be partial to these cameras and the lens flexibility they offer. Because technology has advanced the way it has, making a decision between the two cameras really depends on several factors. For example, photographers must decide how they plan to use the cameras as they may be better suited for different situations. Sometimes, convenience is a factor and you may not want to lug the larger Nikon model and all your equipment to an event. Another defining feature to consider – and one that is sometimes misunderstood – is that clear imaging does not always come down to the megapixel. There is a common misconception that the higher the megapixel rating, the better the image quality. If this were the case, the newest point and shoot cameras with 10 megapixels would be considered the equal of a DSLR with the same megapixel rating. What people should look at instead is the size of the image sensor. Point and shoot cameras generally have smaller sensor images than DSLR’s like the Nikon D3200 and must operate at slower ISO levels. This can result in grainy or unsharp images taken by point and shoot cameras, even if the megapixel number is higher. If you’re on the fence about a point and shoot or a DSLR, keep in mind that the sensor image on the Nikon D3200 is 6016 x 4000. It’s also important to consider your own proficiency with your camera and how advanced you would like to become. DSLRs are great for photo enthusiasts and professionals because they provide a number of options and complex features that can greatly enhance an image to produce the results you see in magazines. However, if you are a beginning enthusiast or just someone looking for something better than an iPhone, the prospect of buying a DSLR may feel overwhelming. You should take a little time to see how easy the automatic features of DSLR’s have become. Your camera is an investment. If you are thinking about buying a point and shoot then you already have an interest in photography beyond what your iPhone can do. Buying a good point and shoot would be an interim step toward buying a DSLR but it is an unnecessary interim step. Buying an entry level DSLR like the Nikon D3200 is much more likely to open the world of photography to you and it will certainly produce better pictures than any point and shoot will produce in the meantime. If you decide you want to get more serious about photography in the future, then your Nikon D3200 is ready to take you there. You would not need to upgrade that camera and even if you want to upgrade it, all Nikon lenses are interchangeable. They money you spend today would not be wasted.